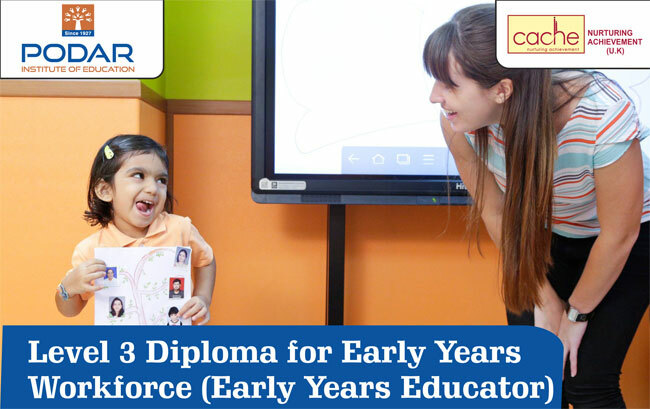 The CACHE Level 3 Diploma in Early Childhood Education-Early Years Educator prepares learners to become Early Years Educators, enabling them to work with children from birth to 5 years. This qualification is suitable for a range of learners, either working or wishing to work in early years education and care. It will help any learner gain an immense amount of knowledge in a well designed structure to ease soaking up all the vital information needed to be an Early Years Educator. The modules have been created to teach learners a vast array of vital knowledge necessary when working with children. The CACHE Level 3 Diploma in Early Childhood Education-Early Years Educators covers children's health and well being, understanding legislation, understanding the value of play and professional development. This qualification consists of mandatory units as well as mandatory guided learning hours. Learn in an inviting environment and experience blended learning by integrating online material as well as face to face classes. Learners will need to be working, volunteering or on a practical placement as an important part of the assessment process involves evaluating skills in real working situations. Young people in schools or colleges and anyone who wants to get trained and prepared for the Early Childhood field. All units will be internally assessed using a range of methods. This could include direct observation within the workplace, a portfolio of evidence, written assignments or a task set by us. This qualification will take 1 – 2 years to complete. Learner should be at least 18 years old and have passed the class 12th exam. Do you need to have practical placement? Placements are required for completing of this qualification. A minimum of 350 placement hours is required. During placement, learners will need support from a professional within the real work environment who will be required to complete professional development records. Upon achievement of this qualification learners will gain their license to practice and it is intended that learners will be able to enter the field of Early Childhood Education as Early Years Educators. Legislation, Frameworks and professional practice. Play, development and learning for school readiness.